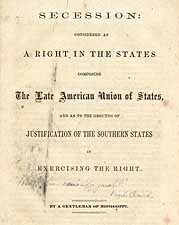 Gentleman of Mississippi Secession: Considered as a Right in the States Composing the Late American Union of States, and as to the Grounds of Justification of the Southern States in Exercising the Right. Secession: Considered as a Right in the States Composing the Late American Union of States, and as to the Grounds of Justification of the Southern States in Exercising the Right. Jackson, Miss. : South-Western Confederate Printing House, 1863.